After perseverance, I would say the next character trait I’ve developed over the years is courage. 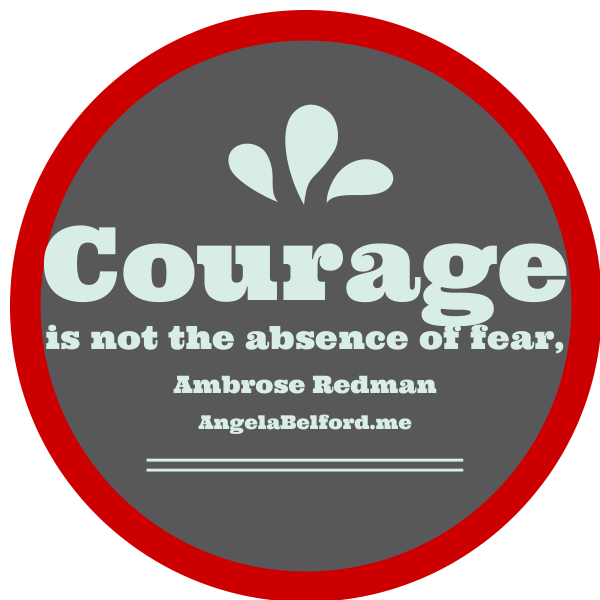 I completely relate to the Ambrose Redmoon quote about courage not being the absence of fear. It has been my experience that fear is real, it is part of life, it is actually useful in cases where you need to be more aware. However, fear should not paralyze us. Fear can be divided into categories. First, there is fear that is based on actual experiences you have encountered. When we are small children we are taught to fear hot stoves, we may have even touched a hot stove accidentally and know that it hurts. This is rational to have a healthy respect for hot stoves. What’s not healthy is when you decide that you are never going to cook again because stoves could burn you. When we drink hot chocolate or coffee and we burn our tongue, we don’t think that we should never drink hot beverages again. We learn and adjust our behavior. We may allow the beverage to cool, we may blow on the drink to cool it faster. We may not care. We don’t stop drinking hot chocolate out of fear of burning our tongue, right? Yet sometimes other experiences cause us to completely change our lives out of fear of pain. The one that comes to mind is people that have been hurt at church. I call them church toast, burnt on both sides. Perhaps they were in a situation where they were judged, ridiculed, ostracized, abandoned or just plain mistreated. Church is full of humans. Many of those humans are hurting. Hurt people, hurt people. It is very tragic and it often results in people leaving the church and never returning. This makes me very sad. I went through a phase where I didn’t like church. I hadn’t been hurt, no one had done a single thing wrong, I just wasn’t happy. I tried to go because I knew it was good for my children and the rest of my family loved our church. I loved the people in my church, but I just wasn’t satisfied. I honestly believe there was nothing the church could have done. I learned to embrace the feeling. Prior to this phase, I had been deliriously happy with our church. The people truly were our family and we loved serving. People would share their story of not liking church or being so hurt in church that they didn’t want to go back. I couldn’t relate. I didn’t judge them, I just had no point of reference to compare and feel empathy. After I went through this season of being unsatisfied, I could relate so much more easily. I could really empathize and I would be less likely to inadvertently give them a pat religious answer. Another category of fear is irrational fear. This is fear that is contrived in your head and has no basis in actual experience (yours or another’s). This fear is very difficult to overcome because it’s hard to use logic to argue against this type of fear because it’s not rational and logical. It can feel very real. We have to confront the evidence and use logic to overcome the irrational. Somewhere on my journey, I learned to apply the “What’s the worst thing that can happen?” logic to my fears. When my daughter, Sami, was 4, she took a tumbling class. She was trying to learn how to do the uneven bars, which I think for four year olds was simply swinging around on one. She decided that she was too afraid to go on them. So we did the “What’s the worst thing that can happen?” (Yes, she was four. Mom – What’s the worst thing that can happen if you get on the uneven bars? Sami – I could fall. Mom – If you fall, what’s the worst thing that can happen? Sami – I could hit my head. Mom – If you hit your head, what’s the worst thing that can happen? Sami – I could have to go to the hospital. Mom – if you go to the hospital, what’s the worst thing that can happen? Sami – I could have to have a test or scan of my head. Mom – if you have a scan of your head, what’s the worst thing that can happen? Sami – Uh, I don’t know. Mom – Well, do you think you might die? Sami – No, you probably wouldn’t let me do something that I might die. Mom – Would you break something? Mom – Then what would happen? Would it heal? Mom – (KEY QUESTION) – so if you fall and hit your head and you won’t die, but you might break something, but it would heal. CAN YOU LIVE WITH THAT, IF THE WORST THING HAPPENS?? Mom – How likely is it that you will breaking something? Mom – Then do you want to try it? I have found this exercise to be very helpful with children and adults. The nice thing about asking questions is that you don’t have to have the logic and it’s a great way to uncover the fear. Once a fear is recognized and out in the open it’s so much easier to deal with. It really takes the sting out of it. (same is true for secrets but that’s another story). The final category of fear that I’ve experienced is subconscious fear. This is a fear that you don’t even realize you have. I find this fear to be the most insidious because I don’t realize it very easily. Subconscious fear shows itself most often for me in procrastination. I keep meaning to do that task, but end up finding 3,000 other things that seem more important. It takes a lot of self-discipline to sit down and do what I have to do. If I am really on my game then I can ask myself, what is going on? Why are you struggling to finish this? It’s often because of fear. Fear of rejection, fear of humiliation, fear of the unknown, fear of loss of control. Writing is like that for me. Some days I have to make myself sit and write for 2 hours. Then to actually publish on my blog is really an act of will. I think it comes down to fear of rejection. How have you overcome fear? ?